Sociologists use the term moral panic to describe what happens when a society overreacts to events or specific behaviours, usually because there is a perceived threat to the social order. Exaggerated rhetoric from the media or public figures can create the feeling that social morality is breaking down. During the 20th century, children were the focus of moral panics over issues such as comic books, dance crazes, devil-worship, and unmarried pregnancy, to name a few. In each case, young people were portrayed as victims amid calls for a new law or policy to reform social morality and protect children. Casting youth in the role of victim makes sense when we remember that Canadians increasingly saw young people as naturally innocent and easily corrupted. Many adults thus believed children needed protection and separation from the mature, adult world. Children also represented the future of the nation, both materially and symbolically, and so anything that threatened young people took on added significance. Moral panics can appear quaint, laughable, or simply unimportant in retrospect — historians have been able to demonstrate in several cases that exaggerated rhetoric and panic was unwarranted. However, historians can learn from moral panics. Take comic books as an example. In the late 1940s, a group of Canadians — educators, parents, medical experts, and the media — opposed comics that told graphic stories of crime, and called for such comics to be outlawed. Comics were blamed for encouraging kids to be violent, prolonging illiteracy, and exposing children to hidden sexual messages. Comics did not lead to the destruction of children’s minds and souls. However, the opposition to them reveals a deeper social anxiety about how family life had changed during WWII. The often-exaggerated concerns of adults also led to actual legislative changes that affected both those who made comics and their youthful consumers. So, moral panics — even if they overstate the extent, gravity, or outcomes of a particular behaviour — have consequences. Figure 10.22 Superior Publishers ran its own line of comics until trade barriers made it easier to reprint American titles for the Canadian market. Moral panics related to childhood and youth may prove to be unwarranted but, in the moment, they can produce substantive responses, as has been documented in historical studies. 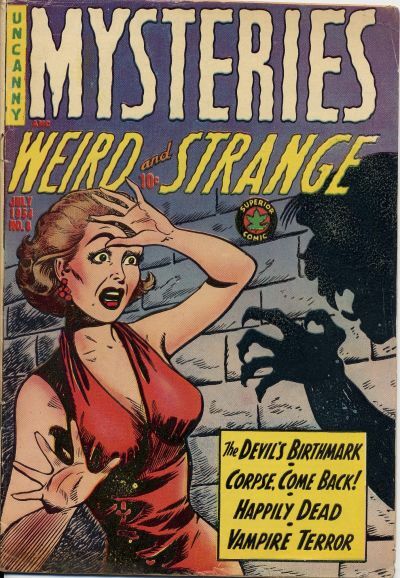 Mysteries #8 by Superior Publishers Limited is used under a CC-BY 3.0 license. 10.12 Youth and Moral Panics by Katharine Rollwagen, Department of History, Vancouver Island University is licensed under a Creative Commons Attribution 4.0 International License, except where otherwise noted.